This weekend was the international drytool weekend. And we had the DDE. We don't have a website. We just had a Facebook Event Page and managed to get more people then the STS and the DTS together! Next to those who subscribed there were also some who just paid and climbed without the competition element. 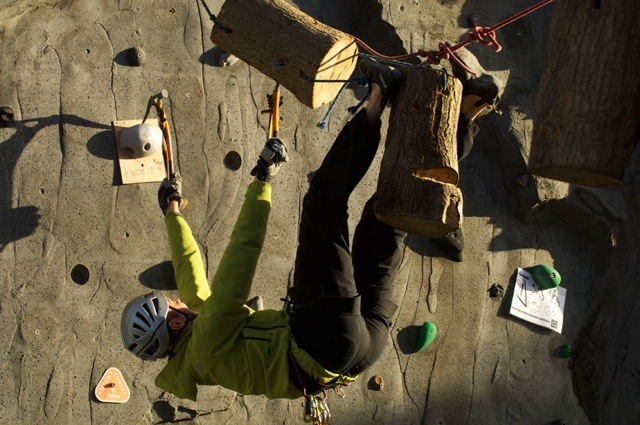 This whole week we'd been hanging on our favourite Dutch mountain to get the 20 routes ready for the big day. The last two days we'd spent on testing and adjusting everything. 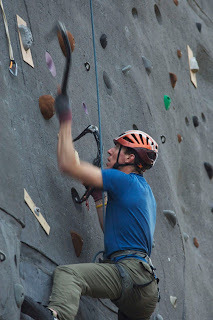 Goal of this event was to have as many people as possible to try drytooling. It all looked cosy and nice. And then the storm came. Super strong wind gusts even ripped the banners off the wall. All big tents were blown away, broken or ripped (those tents are always on the terrain, this never happened before!). But then the rain stopped and over 70 drytoolers were waiting to subscribe. And so with went on. Quite some start-up problems but thanks to Rutger we could actually do the registration in time (sort of in time). Dennis dragged half of the climbers outside in the wind and introduced the whole group to their new friends: Nomic and Nomic. I took the last group for an explanation and forgot to explain how to actually hold Nomic and Nomic. (Too much stuff on my head I guess). To my own surprise all went pretty smooth. No big accidents, all just happy faces and around midday the bar&kitchen crew had pea-soup ready for everyone. At three 'o clock exactly it was time to get ready for the finals. In less then 15 minutes we had a list with the finalists. 8 men and 6 women were there to climb the finals. We decided lead climbing with this wind would be too hard and maybe even dangerous. Yes we do have an indoor wall. Pretty big one actually. But as almost all is overhanging indoors, we got a bit of a safety issue there. When you'd drop your iceaxe it would land in the middle of the gym where all people are belaying... And we wanted to keep all the routes open till the Summer season. We first thought to just have 6 people in the finals in total. Maybe one or two women. There wasn't really enough space for another route on the main wall (next to the 20 we'd already set) and we thought it would take too long if we'd have more then 6 people climbing. But it's also quite unfair to only give a chance to the men and not to the women. 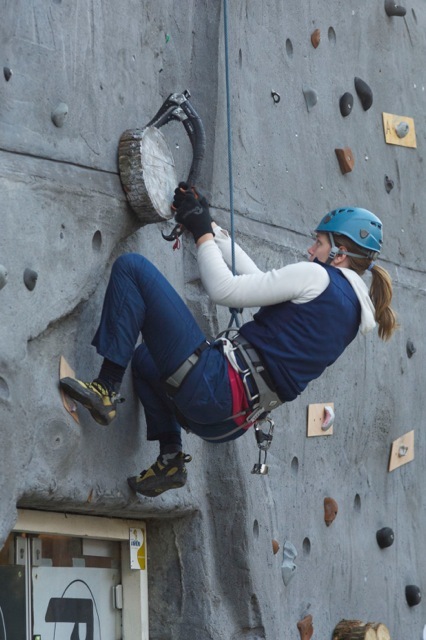 So the best 6 women were invited to climb the finals too! The hard thing with that was, that non of the women were actual iceclimbers. Placing a good swing in the wood in the start of the route was quite an issue. Only Rachel managed to get passed the wood section, passed the long move from the log and onto the technical traverse. Totally out of time (climbing time was 5 minutes) she managed to reach all the way to the high end of the wall. She popped off a small hold but was obviously the best female climber in the comp. Fot the men it was a different story. They managed to pass the wood section in the start. But as only some were real drytoolers, they weren't too secure on the technical traverse. 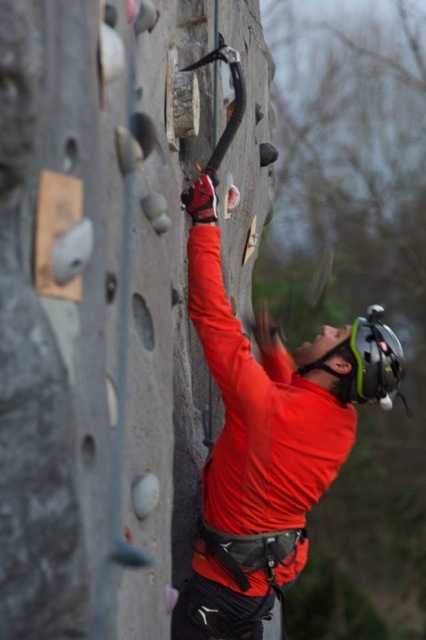 I made the route in such a way that real drytoolers would have an advantage on the sportsclimbers with iceaxes. Knowing how to place your axes and move securely on the sketchy holds was a pré. 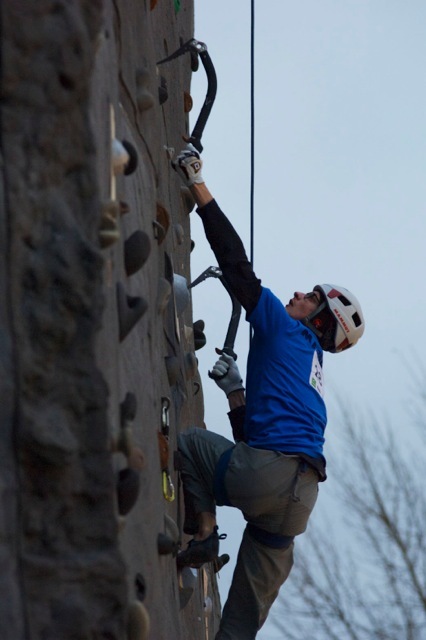 Most climbers popped off early, but some managed to pass the traverse. That time thing was quite an issue. All climbers knew that they had 5 minutes. With one minute left we'd call 'one minute'. But the judges thought five minutes would be too little time to get all the way to the top. Dennis and I were pretty sure the time was enough. And with normal lead climbing they don't call 'one minute'. Never. So when Roeland was climbing he never heard the sign 'one minute'. And then I called him out after 7 minutes as his time was up, for real. Roeland climbing the finals, Dimitri van Heezik (photographer) and Tim van der Linden (NKBV) in the wall and Dennis brother Arno enjoying hot chocolate in the cold. Confusing thing there. It really pissed me off, as I just wanted the competitors to have a hard but honest finals. 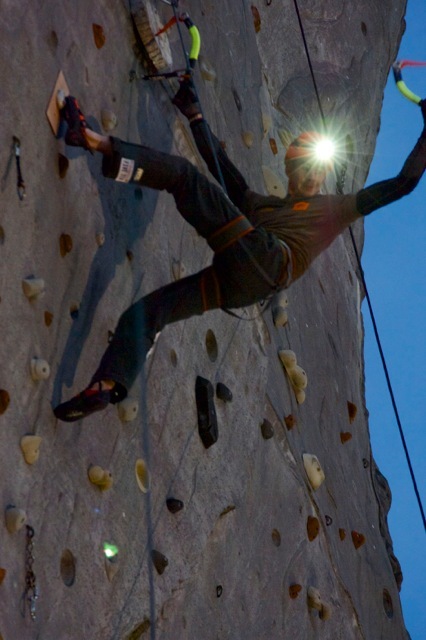 It got dark fast, so we provided all competitors with headlamps so they could still spot all the tiny footholds. We had two friends from Germany, here for the comp. All the way from Germany! Then the last one in the finals. Jurgen Lis from Belgium. Breathing heavily, pushing hard but steady he was quick and solid. Passed the hard sections and found himself on the last moves. Two jumps, or dynamic fig-fours. I was nervous. I knew it was possible...but could he make it. From the small donut shaped hold he had exactly one minute left, feet on the wood, he pulled, jumped and at the same time swung his axe in the final hold. He made it! And so it turned out that Jurgen, the organiser of the Klimax Drytool Event in Belgium won the comp in the Netherlands (after Dennis, won the comp in Belgium). A lot of things can be improved I think. 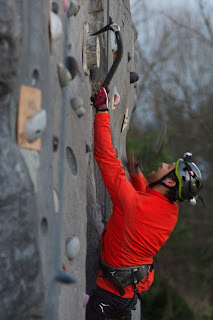 It was SUPER to see everyone climb and share the passion for dry/mixed/ice. Thank you all for being around! Rutger Elink Schuurman to help with the registrations, even today he's still working on it to get a clear result into the NKBV competition system. NKBV Tim van der Linden, Dirkjan van Heumen and Joost Hofman for promoting, judging and the medals for the best three climbers. Ramses Beer, for providing the best beer (Poolvos and IJsbeer) for the finalists. 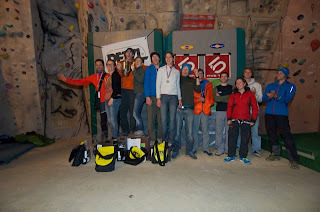 The old iceclimbing team for giving us the inspiration for this event. And you all for being around. And oh, yes, we're still looking for sponsors for the 2013 worldcup/ice season. Please e-mail us to talk about the possibilities!